Psychological warfare is a tactic involving the use of propaganda or similar methods to demoralize the enemy in an attempt to ensure victory, possibly without even having to use physical violence. This form of warfare has matured over time from the intimidating military maneuvers of the Mongols to the spreading of leaflets by the United States over Japan in World War II and later over Afghanistan. New technologies such as the radio, television, and the internet have helped carve the face of modern psychological warfare, ever creating new ways to reach the opposition. As long as war exists, we can expect new forms of psychological warfare to be formulated in attempts to achieve victory at less cost to one's own side. Ultimately, however, the greatest victory will be a world in which all methods of war are unnecessary and human beings can resolve their differences peacefully. Psychological warfare is a tactic used to demoralize one’s opponent in an attempt to ensure victory in battle. By feeding into the pre-existing fears of the enemy, psychological warfare causes terror, encourages opposing forces to retreat, and can end a battle before it begins. Alternatively, it may involve an attempt to sway the enemy's viewpoint towards one's own position, also leading him to abandon the fight. Such methods often include the use of propaganda, and may be supported by military, economic, or political means. Although psychological warfare became common in the twentieth century, its roots go far back in human history. The Tanak (or Old Testament) provides us with examples of psychological warfare from biblical times. During the time before Israel had a king, judges were raised as leaders to rule the people. These judges were both political and military leaders, directing some of the most influential battles in the history of Israel’s attaining the Holy Land. Gideon, one of the earlier and greater judges, used psychological warfare to defeat enemies that greatly out-numbered his own forces. In Judges 7:16-22, there is an account of his battle with the Midianites, Amalekites, and other Eastern tribes who then inhabited the area the Hebrews believed promised to them. According to the biblical account, with a diminished group of only three hundred men, Gideon was able to defeat the much larger army of his enemies. Under Gideon’s instruction, each man carried with him a horn and a torch in a jar so to hide its light. At their leader’s mark, the men broke the jars revealing the light of the torches while yelling, “A sword for YWHW and for Gideon!” Their enemies were terrified and believed they were surrounded by a vast army. In the confusion, the now panicked army turned on itself, killing one another rather than the attacking force. Gideon’s force held the group from retreating and decimated their adversaries. If not for this use of cunning and planning, Gideon and his army would not have been able to overcome the formidable foe. Genghis Khan, leader of the Mongols in the thirteenth century C.E. united his people to eventually conquer more territory than any other leader in human history. This was undoubtedly an exceptional accomplishment, but would have been impossible to achieve had it not been for his use of psychological warfare. Next to mobility, defeating the will of the enemy was the greatest weapon of the Mongols. Before attacking a settlement, the Mongol general would demand tribute and submission to the Khan or otherwise threaten to attack. The Mongols would threaten a village with complete destruction should a single arrow be fired. Most of the initial nations to be conquered, such as the nations of Kiev and Khwarizm, refused to surrender. Consequently, the Mongol general would engage his cavalry in a series of choreographed maneuvers that slaughtered the enemy. He would spare a few, however, allowing them to take their tales of the encroaching horde to the next villages. This created an aura of insecurity with the resistance, eventually supplanting the will of the villagers. Often times, this in itself procured the Mongol victory. Other tactics employed by Genghis Khan included the nocturnal use of fire to create an illusion of numbers. He ordered each soldier to light three torches at dusk in order to deceive and intimidate enemy scouts. In another infamous incident, the Mongol leader, Tamerlane, built a pyramid of 90,000 human heads before the walls of Delhi, to convince them to surrender. Most of the events throughout history involving psychological warfare utilized tactics that instilled fear or a sense of awe towards the enemy. But as humanity continued into the twentieth century, advances in communications technology acted as a catalyst for mass propagandizing. One of the first leaders to relentlessly gain fanatical support through the use of technology was Adolf Hitler. By first creating a speaking environment, designed by Joseph Goebbels, that exaggerated his presence to make him seem almost god-like, Hitler then coupled this with the resonating projections of his orations through a microphone. This was a form of psychological warfare, because the image that he created for himself greatly influenced and swayed the German people to eventually follow him to what would ultimately become their own destruction. Sir Winston Churchill made similar use of radio for propaganda from the Allied side. 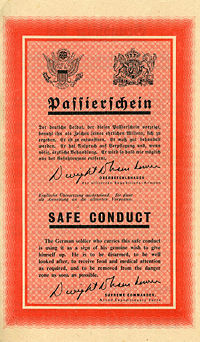 Safe Conduct Pass - most famous and successful propaganda leaflet. Many German soldiers surrendering waived copies of this leaflet, considering it an official document and promise of good treatment. The reverse listed various points from the Geneva and Hague Conventions on treatment of prisoners of war. During WWII, psychological warfare was also used effectively by the American military. The enormous success that the invasion of Normandy displayed was a fusion of psychological warfare with military deception. Before "D-Day," "Operation Quicksilver" created a fictional "First United States Army Group" (FUSAG) commanded by General George S. Patton that supposedly would invade France at the Pas-de-Calais. American troops used false signals, decoy installations, and phony equipment to deceive German observation aircraft and radio intercept operators. This had the desired effect of misleading the German High Command as to the location of the primary invasion, keeping reserves away from the actual landings. Erwin Rommel was the primary target of the psychological aspects of this operation. Convinced that Patton would lead the invasion, as he was clearly the best Allied armor commander, Rommel was caught off-guard and unable to react strongly to the Normandy invasion, since Patton's illusionary FUSAG had not "yet" landed. Confidence in his own military intelligence and judgment was also reduced sufficiently that the German response to the beachhead was simply not decisive. Had Rommel reacted strongly with all he had to the initial invasion, it might have failed. The edge provided by his hesitation and uncertainty was pivotal in the overall war effort and outcome. America also used psychological warfare with some success in Japan during the same war. 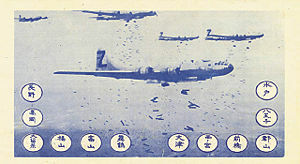 The Lemay bombing leaflets over Japan at the end of WWII was a major move by American forces. These documents, containing propaganda in Japanese, fostered distrust of Japanese leaders and encouraged the surrender of Japanese forces. Lord Haw-Haw was the nickname of an announcer on the English-language propaganda radio program of World War II, Germany Calling. The program was broadcast by Nazi Germany to audiences in Great Britain on the medium wave station "Radio Hamburg" and by shortwave to the United States, starting on September 18, 1939 and continuing until April 30, 1945, when the British Army overran Hamburg. The name "Lord Haw-Haw" is most commonly associated with the Irish-American William Joyce, a former member of the British Union of Fascists, whose on-air style approximated to a sneering mockery of the British military effort against the Germans. More generally, however, the name Lord Haw-Haw applied to the various announcers who took part in the broadcasts. Joyce had a singular Irish-American-English-German accent; his distinctive pronunciation of "Jairmany calling, Jairmany calling" was readily recognized by his listeners, who, in the early days of the war, attributed to him an intimate and sinister knowledge of everything going on in all the towns and villages of England. Perhaps because of the fear his alleged omniscience had inspired, Joyce was hanged for treason on January 3, 1946, after having been captured in northern Germany just as the war ended. As J.A. Cole wrote, "The British public would not have been surprised if, in that Flensburg wood, Haw-Haw had carried in his pocket a secret weapon capable of annihilating an armoured brigade." "Axis Sally" (November 29, 1900 – June 25, 1988) was a female radio personality during World War II. Born Mildred Elizabeth Sisk in Portland, Maine, she took the name Mildred Gillars as a small child after her mother remarried and moved to New York City where young Mildred dreamed of becoming an actress, but she met with little success. Gillars studied drama at Ohio Wesleyan University, but dropped out before graduating. She found employment in Europe, working as an English instructor at the Berlitz School of Languages in Berlin, Germany, in 1935. Later, she accepted a job as an announcer and actress with Radio Berlin, where she remained until Nazi Germany fell in 1945. With her sultry voice, Gillars was a well-known propagandist to Allied troops, who gave her the nickname "Axis Sally." Her most infamous broadcast was made on May 11, 1944, prior to the "D-Day" invasion of Normandy, France. Gillars portrayed an American mother who dreamed that her son had been killed in the English Channel. An announcer's voice made the message clear: "The D of D-Day stands for doom… disaster… death… defeat… Dunkerque or Dieppe." After the war, Gillars was captured and eventually flown back to the United States in 1948. She was charged with ten counts of treason, although she was actually only tried for eight. The sensational, six-week trial ended on March 8, 1949. After long deliberations, the jury convicted Gillars on only one count of treason. Gillars was sentenced to 10 to 30 years, and died of natural causes at the age of 87. Tokyo Rose was a name given by United States forces in the South Pacific during World War II to any of several English-speaking female broadcasters of Japanese propaganda. 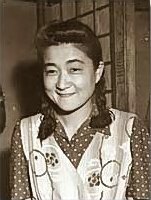 The name is usually associated with Iva Toguri D'Aquino, a United States citizen who was in Japan at the start of the war. In 1949, D'Aquino was tried and convicted of treason by the United States government, based on perjured testimony. She was later pardoned by U.S. President Gerald Ford. Seoul City Sue is the nickname given by American soldiers to the female announcer of a series of North Korean propaganda radio broadcasts during the Korean War. She would read the names from "dog tags" taken from killed American soldiers to a musical accompaniment. She first went on the air in early August 1950. Later that month, she was identified as American-born Mrs. Anna Wallace Suhr, wife of a Korean newsman, by the Methodist Missionary Organization. The group said that Suhr, at the time in her mid-40s, was a former missionary schoolteacher in Korea, and had tutored American diplomats' children in Seoul. Suhr's defenders claimed the dull tone of her broadcasts as proof that she was being forced to make them. Trinh Thi Ngo (born 1931), known as Hanoi Hannah, was a Vietnamese woman who, during the Vietnam War in the 1960s and 1970s, read broadcast radio messages and propaganda to convince U.S. troops to desert their unit or go "AWOL" (Absent Without Official Leave). This psychological warfare scheme was set up by the Communist North Vietnamese. Broadcasting of white noise to convince eavesdroppers that encryption was in use, and to waste vast sums of time and money trying to decrypt it. Recruiting particularly innocent-appearing individuals to be spies or saboteurs so that, when revealed or captured, doubt would be cast on many more individuals. Various methods to ensure that any captured agent implicated as many innocent others as possible, for instance, maximizing the number of questionable contacts. The so-called "information age" that began in the 1980s provided the potential to extend psychological warfare throughout all civilian activities. Growing exponentially through the rise of radio, television, and finally manifesting itself on the Internet, the power of those who framed facts about the world steadily grew during the postwar period. A failed UNESCO effort to put countries in more control of reporting about themselves was evidence that many in developing countries saw the extreme danger of most of their citizens learning about their own country from outside news sources. 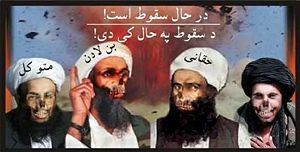 US PSYOP leaflet used in Afghanistan meant to inspire fear among the terrorist groups targeted. This was done in hopes to subvert confidence and encourage surrender. The use of vehicles to create mobile broadcasting stations, allowing the U.S. military to verbally harass and agitate Taliban fighters in Afghanistan so that they emerged from hiding places and engaged US troops. Mohammed Saeed al-Sahaf (Arabic محمد سعيد الصحاف also Mohammed Said al-Sahhaf) (born 1940) an Iraqi diplomat and politician who came to prominence around the world in 2003, when he was the Information Minister of Iraq. He became known for his daily press briefings in Baghdad during the 2003 Iraq War, where his lies, fantasies, and colorful description of his enemies reached meteoric heights as the war progressed, causing him to be nicknamed Baghdad Bob (in the style of "Hanoi Hannah" or "Seoul City Sue") by commentators in the United States, and Comical Ali (an allusion to Chemical Ali, the nickname of former Iraqi Defense Minister, Ali Hassan al-Majid) by commentators in the United Kingdom. 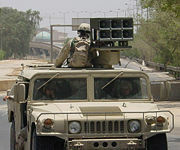 On April 7, 2003, Al-Sahaf claimed that there were no American troops in Baghdad, and that the Americans were committing suicide by the hundreds at the city's gates, despite the fact that the imminent fall of Baghdad and the Hussein government was obvious to those aware of the progress of the war, and that American tanks were in the streets only a few hundred meters from the location where the press conference was being held. His last public appearance as Information Minister was on April 8, 2003, when he said that the Americans "are going to surrender or be burned in their tanks. They will surrender; it is they who will surrender." Although appearing as obvious lies to the Western public, the descriptions uttered by al-Sahaf were well received in parts of the Arab world most fiercely opposed to the war. Thus the quick fall of Baghdad was to some a total surprise, and Syrian television did not broadcast images of the events. Many in Arab countries who were interviewed later were incredulous and were forced to conclude that he, and their own media, had been lying, comparable to a similar watershed event that came out of the Arab-Israeli wars several decades earlier. Psychological warfare is a tool used to demoralize one's adversary in an attempt to ensure victory. Over time, this device has evolved from Genghis Khan’s brutal tactics to the hypnotizing words of "Tokyo Rose" and "Baghdad Bob." While the methods of psychological warfare are ever changing, the underlying goal remains the same: to attack one’s enemies through the mind as well as the body, and in doing so, overcome them. Although it can be argued that the use of such methods may be preferable to direct, physical violence against others, ultimately, the goal of humankind is not to find more effective ways to defeat one's enemy, but rather to find the way for all humankind to live together in peace and harmony, without recourse to any type of warfare. ↑ Cole, J.A. 1965. Lord Haw-Haw & William Joyce: The Full Story. New York. "The Search for Hanoi Hannah"
This page was last modified on 12 June 2015, at 16:07.